At nix.snailbarf.org you can avoid the hassle of staking your own wallet 24/7 and get maximum returns with a minumum fee. Simply use the information below to let me stake on your behalf then sit back and let your NIX pile up! A contract created on April 15th has been incorrectly submitted (Leasing to a Reward Address). If this is yours, please cancel it and try again! Warning: The GUI Wallet (version 1.0.2) has some misleading text in the "New Leasing Contract" window. This will be fixed in the next release. 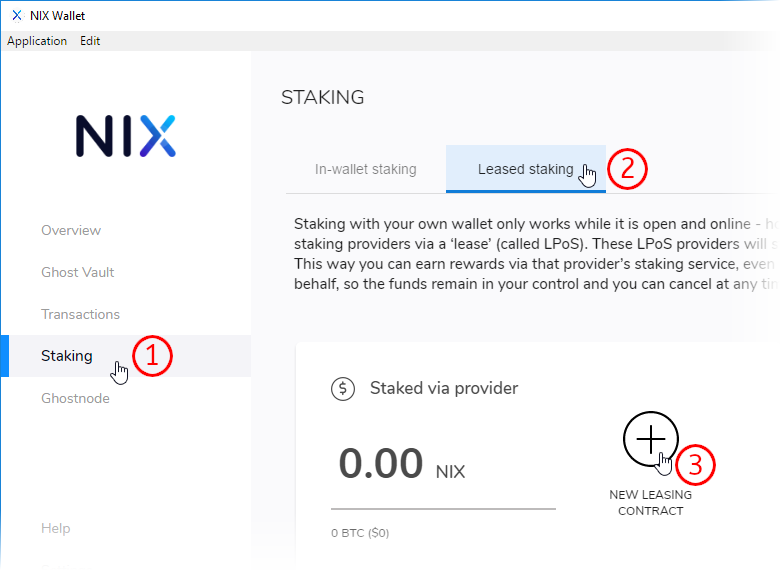 Staking from a Bech32 address will be a requirement for participation in the upcoming NIX Platform Off-Chain Governance ecosystem. Click on your wallet below for detailed setup instructions. Amount: Enter the amount of coins you wish for me to stake on your behalf. If you'd like to stake everything in your wallet, put in the full amount and check the "Subtract fee from amount" box. Check the box for "Enable fee payout"
Click the "Send NIX" button and after 200 confirmations (a network requirement), I will be actively staking for you. From the left-hand menu, click on "Staking". 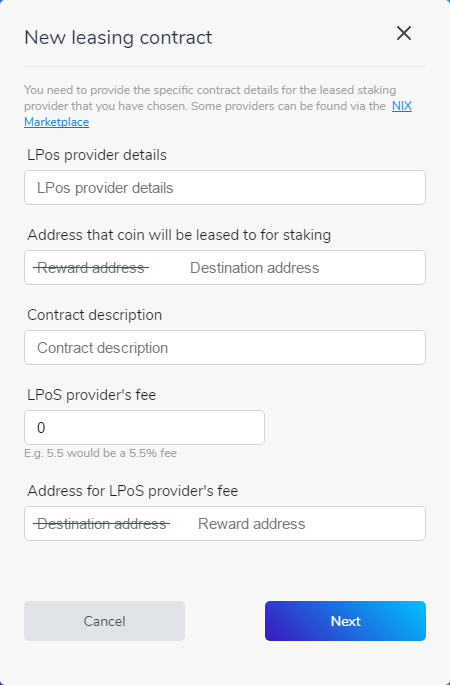 Under the Staking menu at the top, click on "Leased staking"
Click on "New Leasing Contract"
Click the "Next" button and enter an amount to stake along with your password and after 200 confirmations (a network requirement), I will be actively staking for you. If you do not wish to participate in the NIX Platform Off-Chain Governance, please use a Standard (P2SH Segwit) address. Click on your wallet below for detailed setup instructions. What is the difference between using Bech32 and a Standard (P2SH Segwit) address? In order to participate in the upcoming NIX Platform Off-Chain Governance, you must stake from a Bech32 (nix1*) address. If you don't intend to vote, I recommend that you use a Standard (P2SH Segwit) address because one of the requirements for a proposal to pass is that at least 50% of eligible votes are cast. Is there a minimum amount I need to stake? Nope. Whether you are staking just a few or a whole bunch, you can rest assured that you'll get the maximum amount of uptime possible without having to run your own staking wallet 24/7. How good is your uptime for staking coins? 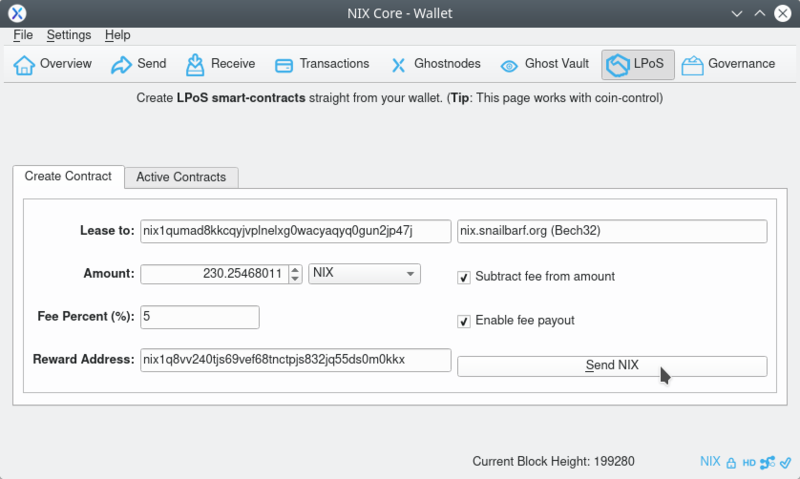 I can't claim it is 100% because when a new NIX core wallet version is released it takes a minute or so to resync the blockchain. Also, when I do a system update it takes about 5 seconds for it to reboot. So, I can confidently say my uptime for staking coins is 99.9999%. Open your wallet that contains the contract for the coins I'm staking on your behalf and look at the transactions list. From the Send tab, click on the "Inputs..." button. Right click the address that contains the amount of coins you are staking to copy it. Are my coins added to a pool that enables me to get stake rewards on a set schedule? No. The time between stakes will be no different than if you were staking them yourself 24/7. What happens with my stake rewards? Your rewards are automagically added to your contract which increases your chances of finding a new block without you having to do anything at all. What happens if you decide to discontinue this service? Because I am not able to cancel your contract, the only way I can alert people to this highly unlikely event is by announcing it on this site. But honestly, I have absolutely no intention of ever doing so. As part of the NIX community known as Beekers McCluer on both Telegram (@Beekers) and Discord (@Beekers McCluer#9206) since before the first NIX block was mined, you can always find me there. Join us and say hi! Alternatively, send me a message with the form below and I will get back to you soon. My IT experience includes over 10 years of Network Engineering in addition to general hardware and system administration. Staking on your behalf requires no additional cost for me to pass along to you, as I am already staking my own coins which I watch very closely in order to maximize my (and your) returns. It is in my best interest to provide you with successful stakes as often as computerly/humanly possible, and that is exactly what I will do. Isn't trustless blockchain technology great? !